It is with deep regret that the Ministry of Defence must confirm that 3 soldiers from the Royal Military Police (RMP) were killed, and 1 seriously wounded, during an incident in central Basrah on the morning of Saturday 23 August 2003. I am deeply saddened by this tragic event. My thoughts, and those of the men and women of the Royal Military Police, are with the families and friends of those who have lost their lives. I hope that they will be given the space to grieve. These soldiers have been a credit to the RMP and have made a significant contribution to the rebuilding of the local police force in the region. This incident will not deter us from our mission and we will continue to work closely with our Iraqi colleagues to seek out those responsible for this criminal act and bring them to justice. The impact of yesterday’s tragedy in Basrah, where three men of the Royal Military Police were killed, is only now beginning to be felt. The thoughts of all past and present members of the Royal Military Police are with the families. All three soldiers had young families and we will be there for them over the coming days and weeks. The RMP are one of the key players in the efforts to reform and resurrect the civil police in Iraq, and I am proud of the role played in this by Corporal Dewi Pritchard, from 116 Provost Company, West Bromwich, and Warrant Officer Colin Wall and Major Matthew Titchener, who were both from 150 Provost Company in Catterick. This essential work will continue beyond this tragedy. Matt Titchener, aged 32 from Southport, Merseyside, was married to Raqual for almost six years and they have a young son called Matheson. Raqual is expecting their second child in December. 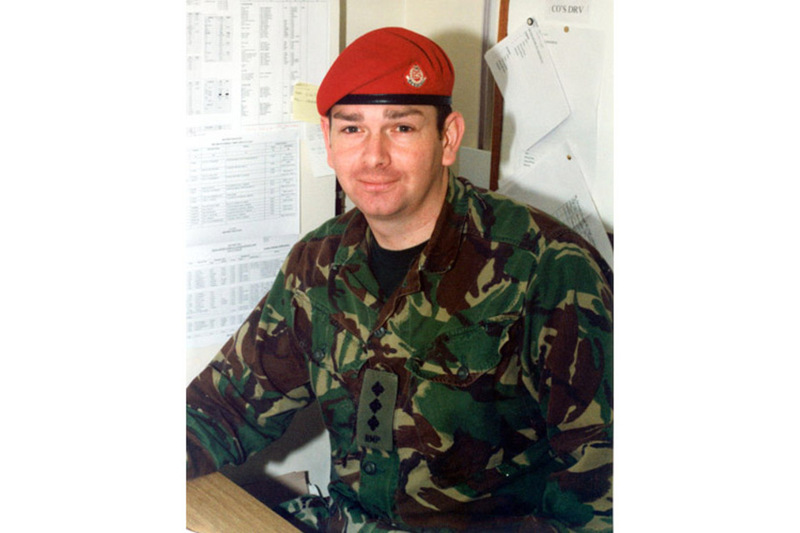 He was commissioned into the 1st Battalion the King’s Regiment in April 1992 and served world-wide including; Northern Ireland, Cyprus, Jordan, Egypt and Canada. He also served as an Instructor at the Infantry Training Centre at Catterick and Strensall and commanded 26 Cadet Training Team in Manchester. In May 1999 he transferred to the Royal Military Police. His appointments included Adjutant 6 RMP, Northern Ireland, Officer Commanding 170 Pro Coy RMP in Edinburgh and most recently as Officer Commanding 150 Pro Coy 3 RMP based in Catterick, North Yorkshire. Matt was an officer of the very highest calibre. He was an intelligent, highly motivated and dedicated leader. He set the highest of standards and successfully ensured that all who came within his influence were inspired by his strength of character, sense of humour and compassion. Matt was a perfect husband and a brilliant Dad. He was delighted at the thought of being a Dad again. He died doing a job he was proud of and was professional to the very end. Matt was a loving son who we are really proud of. Words cannot describe how much we will miss him. Matt was a highly talented and motivated Officer who was liked and respected by all who knew him. His untimely death is a blow to all in the RMP family, but particularly to those who worked closely with him here in Catterick. It was a pleasure to have known him and he will be sorely missed both personally and professionally. Our thoughts and prayers are with his wife, parents and family at this difficult time. The media are requested to respect the family’s privacy at this very difficult time. Colin Wall aged 34, from Crawleyside, County Durham, was married to Trish for almost eight years and they have an 11-month-old son called Alexander. Colin also has two other children from a previous marriage to Isabella: a daughter Lauren, 12, and a son Robert, ten. He enlisted into the Army as a Junior Leader soldier in Bovington in September 1985 and subsequently joined the RMP. He served in Belize, Germany, Canada, Northern Ireland and England. He also completed operational tours of duty in Kosovo and Iraq. Colin was a highly focussed and professional soldier. His calm and measured approach commanded respect and admiration from all who knew him. He was immensely proud of the role he played within the RMP, in particular as the Company Sergeant Major. His first priority was always the morale and motivation of the men and women in his care. His main passions outside army life were his family, walking his dogs, and ‘tinkering’ with and restoring cars. Colin was a loving son and we are very proud of him. He loved his family and enjoyed spending time walking in the Weardales. 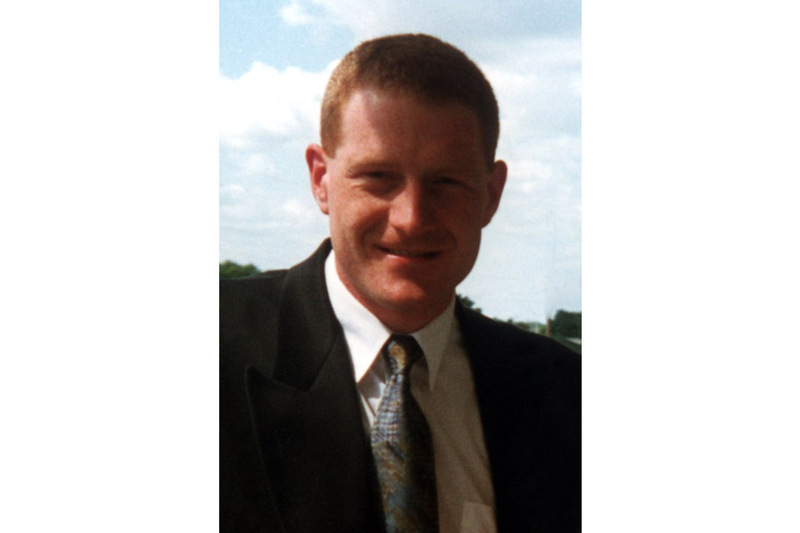 Colin was the epitome of a Company Sergeant Major and made a real difference to the operational effectiveness of the Company. His untimely death is a blow to all in the RMP family and to all those who worked closely with him here in Catterick. He had many friends in the Company and will be sorely missed by all who knew him. Our thoughts and prayers are with his wife, parents and family at this difficult time. Corporal Pritchard, aged 35, leaves a beloved wife Tracey, daughter Kira aged six, and son Ethan aged one. His father and mother, Tony and Mair, and only brother Paul, have expressed their deep shock. Dewi Pritchard was born and brought up in the Rhondda in south Wales. He attended Gelli Junior School and Treorchy Comprehensive. As a youngster, he enjoyed every sport and threw himself into many social and sporting activities. He met and fell in love with Tracey in 1990, and they were married in Florida in 1996. Dewi was a loving and doting husband and father. A strong and happy family, they lived in Bridgend and Dewi worked for Bosch in Miskin. Mobilised in May, he had only been back in Basrah for one day following his return from six days rest and recuperation. The family remember him as a brave, professional and proud TA military policeman who served his country to his best. All of us within the Regiment and across the Royal Military Police are devastated by the news and our thoughts are with all the families at this time, and in particular Dewi’s wife Tracey and their two young children, Kira and Ethan. 4th Regiment RMP is a truly composite regiment of Regular and Territorial Army personnel. The Regiment deployed personnel to Iraq and Kuwait in June 2003. Regular and Territorial soldiers have stood side-by-side, facing hardship and danger together. In early August, members of the Regiment, including Corporal Pritchard, came under the command of 3rd Regiment RMP, and have continued the vital work of restoring law and order in the region. We should all be very proud of the contribution that all the deployed members of our Regiment have made. They have displayed true heroism, professionalism and dedication in bringing help and assistance to the people of Iraq. Corporal Dewi Pritchard epitomised everything that we hold dear in the Royal Military Police. Dewi Pritchard was a very popular and loyal member of the Territorial Army. 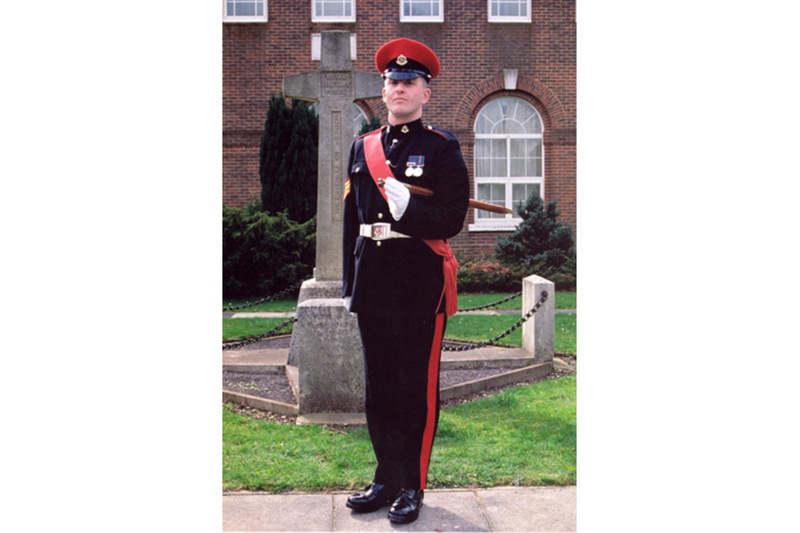 He joined the RMP in 1996, and from the outset of his service was an outstanding Junior Non-Commissioned Officer. He was awarded the Provost Marshal’s Gold Whistle & Chain for Best Recruit on his course, and had continued to show true professionalism and dedication throughout his time in the Royal Military Police. He was promoted to Corporal in 1999, and was committed to his TA career. Corporal Pritchard was mobilised for service in Iraq, and sadly paid the ultimate price for his service to Queen and Country. He will be greatly missed by his colleagues, all of whom held him in the highest regard. As soldiers we never forget our comrades who are no longer by our side. We can only hope to uphold their example when it is necessary to do so. Today, his colleagues in Iraq continue their mission. Our prayers and thoughts are also with them. Almighty God, by whose grace we are called to positions of responsibility and trust, bless, we pray Thee, all members of the Royal Military Police and those who have previously served in the Corps of the Royal Military Police. Inspire them to courage and wisdom, courtesy and faithfulness: grant them a true knowledge of Thy will that they may guide their comrades aright: that by serving others in Justice and mercy they may also serve Thee and so become worthy of their calling.